Robert A. 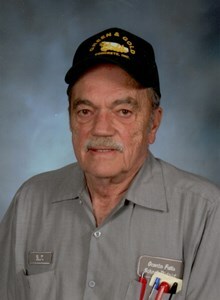 “BJ” Johnson, 80, of Oconto Falls, passed away March 24th, 2019 with family by his side. Born July 27, 1938 to Arvilla Bartz and Robert Johnson. BJ was raised in Oconto Falls and lived his entire life in Oconto Falls, and graduated with the class of 1957. In 1959 he joined the U.S. Air Force and was honorably discharged in 1963. In 1965 he married Judith Prokosh of Pulaski. Together they had three children. They divorced in 1977. He worked at Green Bay Packaging from 1967 until December of 1979 when he was hired at Oconto Falls High School as a custodian. He was there for 32 years until his retirement in August of 2011. He enjoyed the students and teachers and missed it a lot after he left. He enjoyed fishing, hunting, gardening, and going to the casino. He is survived by his wife, Sharon; brother, Bill (Alberta) of Redding, CA; sister, Bonnie (Vic) Peterson of Oconto Falls; daughter, Bobbie Jo & Shane Brenneke of Hortonville; son, Robby & Fiancée Jeannie Peterson of Vesper; son, Ryan & Shell of Belton, MO; 3 step-children: Chad (Char Moore) of Shawano, Deana Edelburg of Lakewood, and Richelle (Kevin) of Fort Wayne, IN. He is also survived by 7 grandsons, 4 granddaughters, and 5 great-grandsons. He was preceded in death by his parents, Arvilla and Robert and son-in-law, Jody Mahon. Per BJ’s wishes, there will not be any showing or a funeral. My deepest condolences for your family in your loss. BJ was one of the nicest man at OFHS and the community. He will be greatly missed. Cherish your memories of BJ, those memories will help you get through the difficult days ahead. I graduated from OF in 1995. BJ was always such a great guy, with a joke or a smile on his face, yet he kept us all under control if need be. I have seen him out and about several times since graduating, and he always said hello with that big smile. He will be greatly missed by a lot of people in the community. My prayers and condolences to the family. I am sorry to hear of BJ's passing. He was well liked, me included. I worked at the high school for 5 yrs while he was there. He was so nice. My deepest sympathy for you all. BJ was a great guy and when I was in high School he always sought me out prior to a basketball or football game to Wish me good luck. He was just a genuine nice unassuming guy who liked talking with the high school kids. Very sorry to hear of his passing but know he is in a beautiful place. So incredibly sad to see that B.J passed. I taught at Oconto Falls High School for 18 years with him. He and I had many excellent talks about life. He was a sweetheart. BJ always took amazing care of the Art Department that I was a part of. He loved being around everyone and always had time to help a teacher, coach or student. I would see him occasionally at the grocery store after he retired and I always got a huge hug and we'd catch up. My heart is truly sad that he is gone. He was one of a kind great guy. BJ was a welcome face when entering the school each day. He will be remembered and loved by so many students that pasted through over the years. God bless to the family. To the family of B. J. , Sharon, my deepest sympathy to you. For what it is worth, I know he is no longer in pain. He will keep watch over you. Trust God for strength and knowledge as to know what to do or say. God loves you. You have friends and family to help you too. Ask for help , it’s nothing to be embarrassed about. Our thoughts & prayers to BJ's family and to our classmate Bobbie Jo. BJ will always be remembered as kind hearted & having a smile to greet you in the hallways. My sincere condolences to the Johnson Families!My late husband, David) was a classmate of BJ,he spent many hours in his younger years playing basketball with BJ and Scrappy! He will be remembered with fond memories. Sharon, Bill and Bonnie, I am so sorry to read of BJ's passing. Please accept my sympathy to you all. I will remeber him as always so friendly and always taking time to talk whenever I would see him. I haven't seen him in a few years after we have moved though. Treasure all those memories and he will always be with you in your hearts. Bj was one of the coolest people I was honored to know. I graduated OFHS in 2004, everyday BJ would greet me with a smile, ask how my day was, or just a simple high five as we walked past each other. He made OFHS a great place. He will be greatly missed!! Sharon & family, The Class of 1957 is saddened to hear of BJ's passing. It is always sad to lose another classmate. We all remember Bob with a lot of memories of good times and a few good laughs. He came from a great family, was loved by many students at OFHS, and I am sure it was hard for him to leave his position at school. May God bless you all at this sad time!